The kitchen pantry has to be the most accessible storage in the kitchen as it is the most used. Aside from keeping everything within your reach, these kitchen organisers clear out your kitchen clutter, too. With the ELITE® range of innovative pantry storage systems you will never need to reach to the back of the shelf again. Choose from our best-sellers below, and impress your guests with these smart storage shelves! Which style of Pantry are you looking for? 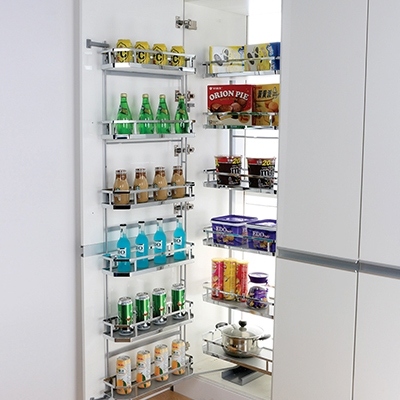 The Elite range of kitchen pantry organisers are designed in three main styles. Pull Out Pantry / Slide Out Pantry - A sliding pantry shelving system that pulls out horizontally with access to your pantry baskets from both sides. Open Out Pantry - A tandem style pantry design for hinged pantry doors with sliding pantry shelves that pull out for easy access when the pantry doors are open. Pantry Pull Out Drawers - An individual system of pantry style shelving that can be installed separately into the same cabinet space and pulled out individually. Both the Pull Out and Open Out Styles come in a range of different styles of Pantry Shelves or Basket styles. All styles of pantry baskets come with identical pantry frame units made from high quality, durable stainless steel and smooth, soft close runners. The Elite range of kitchen pantry storage systems are designed to retro-fit into standard kitchen cupboard sizes, or as a fresh install into brand new kitchen cupboards and pantries. This ensures that no matter what type of renovation or fresh build scenario you are dealing with, there will be a product and style to match your tastes and space requirements. Whatever solution your require for your kitchen storage problems, Renovator Store has you covered with quality taps for sale online at the best prices with our warehouses ready to despatch to you from Melbourne, Sydney, Adelaide and Brisbane.